To say that Buenos Aires is hungry for change would be an understatement: Each daily transaction from shopping at the supermarket to riding a bus involves careful planning, literally down to the last cent. Reason: there are not enough coins in circulation in Argentina's capital to make change. "I have to hold my purse steady when shopping", says Laura Daniel, a Buenos Aires housewife, "because if the shop owner hears coins clinking inside, he's going to demand I pay with them. And it could get nasty, because I need the loose change for the bus, which doesn't accept bills." Normal shopping etiquette has completely broken down in Latin America's most elegant city. Sales staff have no compunction about peering into clients' purses and demanding the exact amount. Big supermarkets regularly round off the difference in their own favor, even though there is a law against it. Small mom-and pop stores, meanwhile, routinely offer candy as change in lieu of coins. And if you refuse to add more bon-bons to the swelling collection in your purse, many store owners prefer to lose the sale than to part with their precious cents. "Clients always return, but coins are impossible to find," explains one vendor. Even though the Central Bank has responded by minting new coins in record-breaking quantities this year, the problem appears to be getting worse. "There's a black market involving the bus companies and the money transporters who collect their coin earnings each day," says Central Bank spokesman Fernando Meanos. "Instead of depositing the coins in the bank, these transporters are reselling the coins." In a raid on the Maco transport company in Buenos Aires last month, police seized 13 million coins. The Central Bank promptly returned the money to Maco  in bills. Maco has denied any wrongdoing, saying it merely classifies and shrink-wraps coins collected each day before redistributing them to their clients, which include large retail chains and even the city's subway company, Metrovias. "All this has a production cost and we charge for the service," says Maco director Fernando Der. Bus companies have also denied the charge. 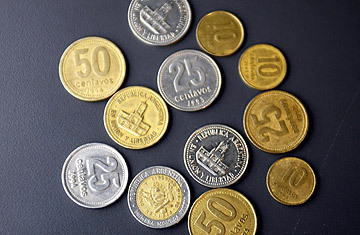 "We're not hoarding coins," says Norberto Canegayo of the Transport Chamber of Buenos Aires province. "We need them to be in circulation for our passengers to pay their tickets." Government officials are not convinced by such arguments. "There is a legal loophole, admitted, because there is no clear-cut law prohibiting this practice," said one government source. Instead, the government has gone after profiteers with a national security law punishing disturbance to the public peace, the only legal instrument at hand. With the cost of acquiring coins denting profit margins across the board, "No Change" signs have sprouted up at most small retailers. And at large supermarkets, clients who don't bring the exact change are made to wait long minutes while the cashier calls a supervisor to bring coins. The ire of those forced to wait on line behind that customer creating a subtle pressure to bring the exact change next time, or to round off in favor of the store. The reviled "No Change" sign can be seen even at local branches of multinational banks and at state banks such as Banco Nacion. Some cynics read them as a Freudian commentary on Argentina's recurrent inability to solve its economic and political problems. Indeed, even as it grapples with Argentina's rapidly declining macro-economic outlook, the government has been unable to resolve the problem of small change. A Central Bank order issued last February obliging banks to exchange up to 100 pesos (about $30) in coins to any individual who presents the cash at a teller's window had no impact, despite thousands of calls to a government hotline from customers reporting banks that refused to comply. In a virtual gesture of despair, the Central Bank this month lowered the banks' obligation, requiring that they break only 20 pesos ($6) per person, although most banks continue to refuse to make change on even that amount. So acute was the coin shortage, one day last month, that the Metrovias subway company was forced to open its turnstiles and let passengers ride for free after it ran out of change. "We started having problems at the beginning of the year because the Central Bank was providing us with only 10% of our daily coin requirement," said a Metrovias spokesperson. Now the subway company is getting 70% of its coins from Maco, and is encouraging customers to buy magnetic ticket cards issued in round peso numbers. The only silver lining in the coin crisis for the long-suffering consumers in Buenos Aires, is that the city's perennially cheerful taxi drivers seem only too happy to round off fares in passengers' favor. "Since I couldn't get coins at the bank I started buying them from a bus company paying a 5% commission," says taxi driver Antonio Corral. "I had a friend there who sold them to me on a side street close to the bus terminal. But now I just slice the cents off the fare instead, I lose about the same amount of money, but I don't lose as much time."